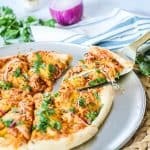 Barbecue Chicken Pizza is one of the most delicious pizza favors of all time! It is the perfect blend of sweet and tangy and surprisingly easy to make at home. 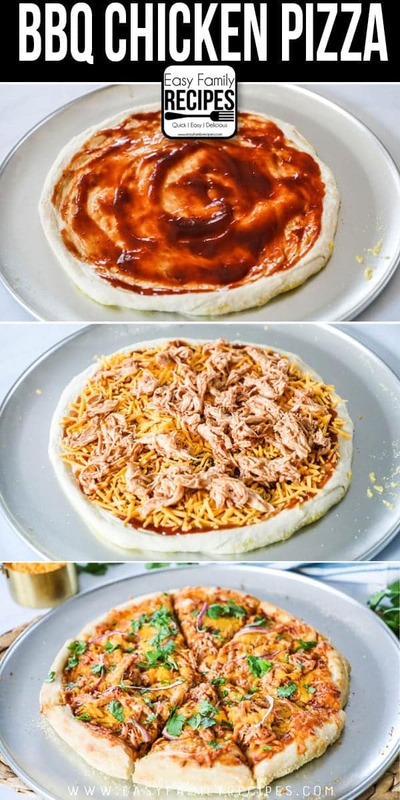 Rich barbecue sauce, tender chicken, delicious cheeses, and more are layered on top of a thin pizza crust to make the perfect combination of flavors. This pizza is familiar enough for children to devour, but so delicious it is perfect to impress guests or make for a party or gathering. 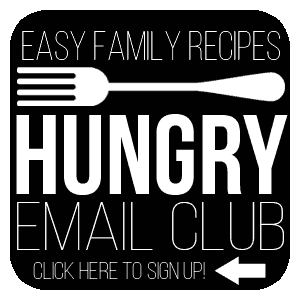 It is a favorite of kids and adults alike and can customized with a list of suggestions to make it perfect for whoever you are serving! Give this delicious pizza a try on your next pizza night! There is little that our family of 5 will ALL devour with no ands, if’s or but’s, however this Barbecue Chicken Pizza ALWAYS disappears almost as quickly as it hits the table. I mean there is just no denying how crazy delicious this pizza is, but what makes it so good? I think the kids love it because the barbecue sauce is such a familiar flavor so we aren’t pushing them too far out if their comfort zone. I think adults like it because it is familiar, but also unexpected. It isn’t a traditional pizza, but it is almost like these flavors were meant to be combined in this exact way to be their most delicious. 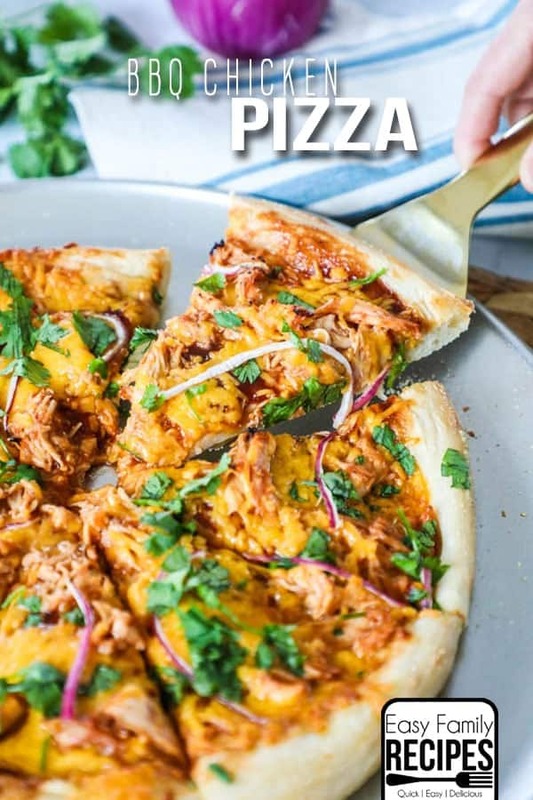 This pizza can be made with any barbecue chicken, but I love to make this recipe with leftovers from this Crockpot Creamy BBQ Chicken recipe. It is a great way to squeeze another meal out of one you have already made! When you are making a pizza from scratch you have a few different options for pizza crust. We have pizza night quite a lot in our home so we have tried out many different types. I will share some of my favorite options with you below along with my notes on them. Homemade pizza dough– If you have the time then making your own pizza crust at home is really very simple. It will require some raise time though so make sure to account for that so you aren’t up all night waiting for your dough. I like this homemade pizza dough recipe. You can also use a bread machine to speed up the process on this! If you double the recipe you can also freeze half of the dough to give you a head start on another night. Store bought pizza dough balls- This is my #1 favorite, and most used way to make pizza at home. You can find pre-made high quality pizza dough at many grocery stores. Trader Joes always has them. I have found them at Harmon’s in Utah, Dave’s and Stop and Shop in New England, and even Walmart in some areas. They are usually in or near the deli section in most stores, but it can vary. Occasionally I have also found them in the freezer section, frozen which is how they are shipped to the store. I think this option gives you the best combo of taste and ease. You can also buy extra and throw them in the freezer to keep on hand. Refrigerated pizza crusts- Many stores carry canned or pre-rolled pizza crust in the refrigerated section near the canned biscuits. You can find them in a can like biscuits or sometimes prerolled but uncooked in plastic packaging. Pillsbury makes both types of these, but there may also be other brands available. These aren’t my favorite but will work in a pinch for sure. Pre-made pizza crusts- Another option for pizza crust is the pre-made, pre-cooked pizza crusts. These are usually found near the bread aisle and are about as fool-proof as they come. These also aren’t my favorite taste-wise but I will often buy the small 3 pack of crusts to keep on hand for letting my kids make their own pizzas since they are so easy to use. These can also be frozen with great results. I am going to walk through a few of my notes on this recipe with you here, to help answer any questions that may arise. You can jump down to the bottom to find the FULL printable recipe card. 1 pizza crust- See my notes above on each type of pizza crust and which may be best depending on how much time you have to make the pizza. 1 tbsp corn meal- This just helps the crust not to stick to the pan and stay crispy. If you have another way you want to keep the crust good, go for it! 1/3 cup BBQ sauce- Sweet Baby Ray’s original BBQ sauceYou can use your favorite brand and flavor. I often use . 8 oz sharp cheddar cheese (more or less to taste)- This part is really up to personal preference. You may use much less than 8 oz, but it depends on how cheesy you want your pizza. If you want your pizza to not be floppy and easily held, then use less cheese. If you aren’t afraid to use a fork and knife because it is worth it for extra ooey gooey cheese, then use a little more! 1/2 cup shredded or chopped BBQ chicken- I most often use this Crockpot BBQ Chicken. You can use leftovers of any BBQ chicken you have, or just grab a rotisserie chicken from the store and pull it off the bone and mix it with a little barbecue sauce to flavor it. 1/2 medium red onion, thinly sliced- Make these slices as thin as possible so they can cook through to release their sweet flavor in the little time they are in the oven. 1/4 cup chopped cilantro- You can leave it off if you don’t love Cilantro, but I think this adds a whole new dimension to the pizza! These are some extra toppings we like to use to customize the pizza for each person. You can add any of these to just a slice or the whole pizza pie! Make sure to cook the pizza on the bottom rack of the oven. This will help the crust get crispy and browed on the bottom. You can make this pizza as thin or thick crust as you want. Just adjust the time accordingly. Thin pizza will cook much more quickly than thicker crust. You can use any old pizza pan to make this. I bought this one at Walmart for about $3. You can store leftovers in a single layer in an airtight container in the refrigerator for up to 3 days. Reheat in a skillet or on a sheet pan in the oven. I really hope this BBQ Chicken pizza is as much of a crowd pleaser for you as it is for me! The whole family gobbles it up without exception! This BBQ Chicken Pizza is the ultimate crowd pleaser! It is the perfect combination of sweet and tangy, familiar enough for kids, and delicious enough for adults to love it too! This recipe makes one 18 inch pizza. Spread the pizza crust into a thin even circle. Use cooking spray and corn meal under crust on a pizza pan to make sure it doesn't stick. Spread the BBQ sauce over the crust evenly. Top with as much cheese as desired. Sprinkle the meat on and top with the thinly sliced red onion, and any desired optional toppings. Bake on the bottom oven rack for 12-16 minutes, or until the crust is cooked through and crispy, and the cheese is melted. Sprinkle the chopped cilantro over the top of the pizza, slice and serve. Enjoy!